As Rare Disease Day approaches, I can't help but think about all of the people that have come into our lives due to Abby being diagnosed with Sanfilippo Syndrome. I have spent numerous hours over the past few weeks focusing on Abby, Sanfilippo Syndrome and how to raise more awareness for rare diseases. As I have tried to come up with creative and catchy ideas, I continually see the faces of the many people that have loved Abby along the way....her teachers. The first that come to mind are the teachers that Abby had before we ever knew she had a rare disease. Those are the teachers that started seeing a change with her and became very concerned. They were there when we thought we were dealing with a developmental delay and they were there when we found out it was so much worse. They were there when we cried at IEP meetings trying to explain Sanfilippo Syndrome and what her future entailed. They handed us tissues and cried along with us. They tutored Abby after school for two years while we desperately tried to maintain the skills she had. They dug deep to find out what she loved and what made her tick, then used those things to keep her engaged and motivated. I look back on those teachers from her early Sanfilippo days and feel so much love and appreciation. I know in my heart that they truly loved her, just as if she was their own. During 3rd grade, we moved and Abby transferred to a new school. My biggest fear was starting over with a new set of teachers and a new Exceptional Children's program. I was fearful of how Abby would be accepted by the new students and how patient the new teachers would be. When describing Abby's behavior and personality, I often describe her as quirky, impulsive, and stubborn with some Obsessive-Compulsive tendencies. She can be challenging to work with and difficult to keep on topic. Thankfully, my fears were quickly put at ease. There was immediate acceptance and understanding. We found her new teachers to be patient with her, while having an openness to learn about her disease. 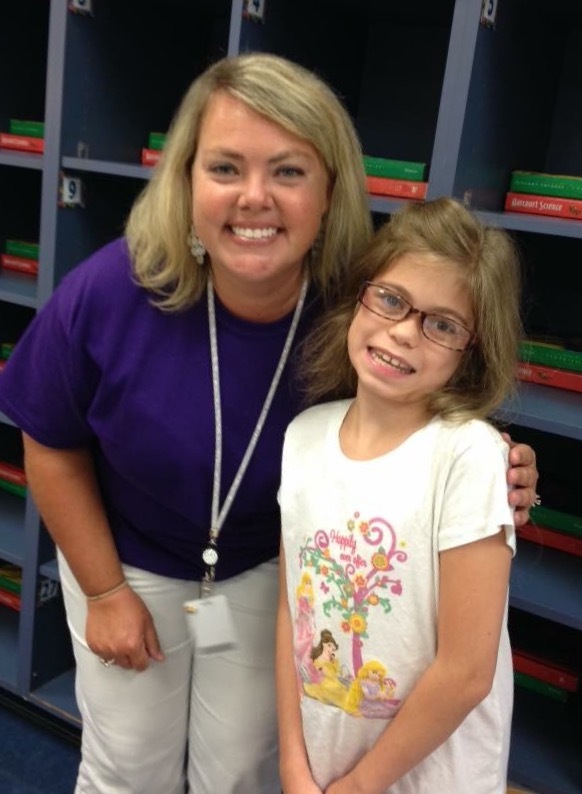 Abby quickly bonded with her new teachers and found acceptance with her new friends. Over the past 2 years, we have had more support than I could have ever asked for. The teachers, parents and students participate in Rare Disease Day, MPS Awareness Day, have purchased t-shirts and bracelets to support our Foundation and have volunteered at our Fundraisers. I feel so at ease sending Abby to school knowing how much she is accepted and understood at school. I truly feel that the teachers at her school model and teach acceptance of others' differences. What a wonderful attribute these students are learning and one that will only help them as they make their way into middle and high school. So to all of the teachers that have entered our lives before and after Abby's diagnosis with Sanfilippo Syndrome, I thank you from the bottom of my heart. You are truly one of the most positive experiences that we have had after being faced with the mortality of our daughter. Thank you for loving Abby as if she were your own. Thank you for your patience and keeping her motivated to learn. Thank you for continuing to teach her regardless of her terminal diagnosis and what her future may hold. Thank you for not giving up on her.